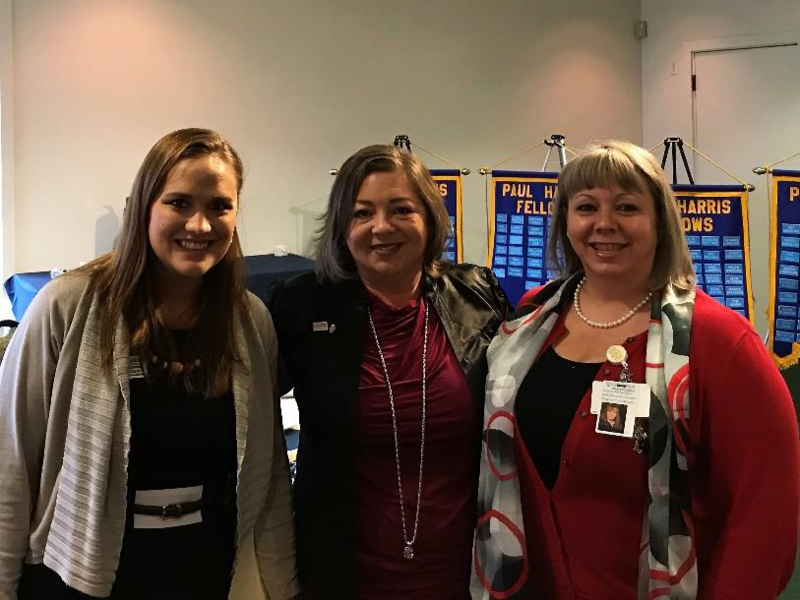 In keeping with the Rotary Theme for April 2018, Maternal and Child Health, the Rotary Club of Sierra Vista welcomed two guest speakers for the April 2, 2018 program. Ms. Sarah Pacheco, Public Relations and Media Specialist of the Chiricahua Community Health Centers Inc. (CCHCI), Sierra Vista Administrative Office, provided an overview of the CCHCI in Cochise County, explaining there has been rapid growth in the need for services and corresponding rapid growth in the services provided and the number of clinics serving the customers in Cochise County. CCHCI is a diverse non-profit health center program grantee/federally qualified health center providing a variety of services. It has been developed to provide services that includes medical, dental, and behavioral health, to ad-dress every aspect of life (physical, emotional, social, occupational, intellectual, and environmental) for the uninsured, underinsured, veterans, migrant and seasonal farmworkers, and all residents of Cochise County. Currently operating from seven fixed sites, three mobile medical units and one mobile dental unit, a full range of primary and preventive health care services are provided for the entire family. Approximately 30,000 patients are seen in the clinics and mobile units, and about 50% of those patients are on AHCCCS (Medicaid). Community Health Centers or CHCs are non-profit medical clinics located throughout Arizona. They share a mission of making comprehensive primary care accessible to anyone regardless of insurance status. Initiatives for the CCHCI include opening a new center in Benson in July 2018, offering much needed pediatrician services. Also, services in Douglas will be expanded to address Special Needs Children. Other initiatives for the mobile units are to be available at the juvenile detention center for medical and behavioral services, and since January, operating a mobile unit in Bisbee "in the Brewery Gulch" to treat drug overuse and opioid patients. In Sierra Vista, CCHCI will soon be breaking ground for a two-story building with a Dental Clinic on the ground floor and administrative offices on the second floor. For more information about CCHCI, go to www.cchci.org or contact Sarah Pacheco at spacheco@cchci.org . Following Ms. Pacheco, the Rotary club members heard Ms. Janetta Richardson, the Well Woman Healthcheck Program Coordinator for the CCHCI, talk about the Well Woman Program Services provided by the CCHCI. The program services are primarily focused on diagnosing breast and cervical cancer for underinsured and uninsured individuals. Breast cancer screening is recommended for women 40-64 years of age and cervical cancer screening is recommended for women 21-64 years of age. To apply for the program, the individual must be a US citizen and an Arizona resident. The screenings lead to diagnosis and treatment programs as needed. CCHCI provides services and screenings at offices in Douglas and a new office in Sierra Vista. Ms. Richardson also spoke about special requirements for services needed along the "Border Walk," – Douglas, AZ and Aqua Prieta, Sonora, Mexico. With the recent closing of the Douglas Hospital and a serious loss of doctors in Douglas and in near-by Benson, many persons in need of medical services can visit the Aqua Prieta Hospital for treatment. There are still many issues to address regarding the treatments available, the payments for services, and even the records sharing capabilities of the Mexican and US doctors and hospitals. There is a long way to go to provide the services to those who have the hardest time paying or getting access to doctors, but there is great cooperation across the border between national representatives of Mexico and Arizona and doctors in both countries. For more information about Well Woman Programs of the CCHCI, contact Ms. Janetta Richardson at jrichardson@cchci.org .